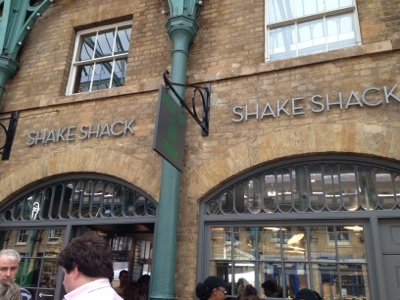 When all the hypes has been around the popular American burger chain Five Guys on Long Acre, not that far down the road at the heart of Covent Garden, I was pleasantly surprised that another popular American burger chain Shake Shack has made their debut appearance in London! 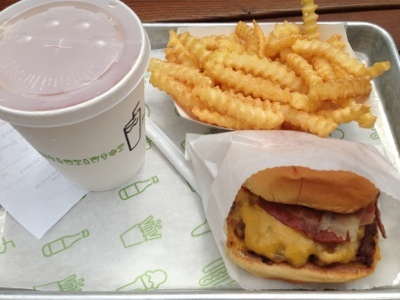 I had good memories about Shake Shack because I was blown away how tasty their burger & chips were when I last visited New York. There is a queue most of the the time. 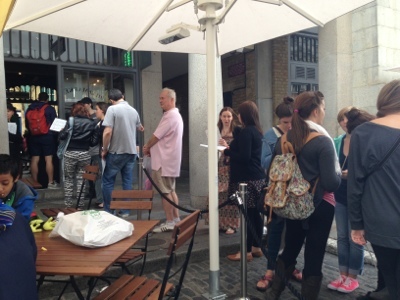 But if you are with friends, chatting & studying the menu while queueing, the time just flies. You place your order at the counter - don't just count your money heads down, but have a look at the kitchen behind, you will be surprised (I was anyway) how many staff it can hold in such a compact space to prepare all the burgers & fries!! Yes, the burgers and fries are made fresh to order. 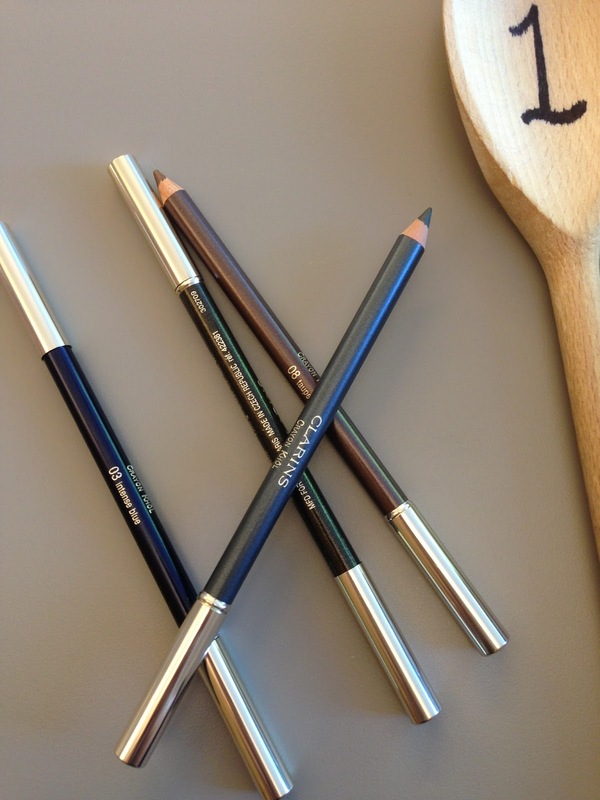 After you hand over your money, you will be given a buzzer to notify you when your order is ready. At this time, you and your friend should be divided into two teams - one team should standby to collect the food, while the other team go to look for free tables & seats. 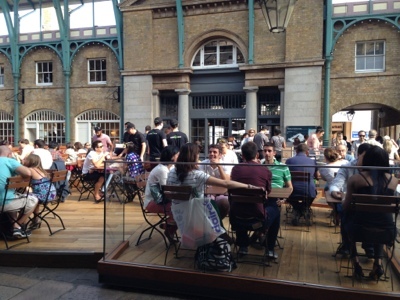 There are outdoor seating areas at both sides of the burger bar, which I think they are best because you can absorb the vibrant atmosphere of the Covent Garden Piazza. However, if you prefer to be quieter or when the weather not permit, Shake Shack also have a two-floored indoor seating as well. Now onto the burger & fries itself. I tried the SmokeShack with original fries, and a 50/50 as drink (half lemonade and half iced tea). I love the 50/50, such a refreshing drink in a summer day. I love the fries too! I love the crinkle cut, somehow the shape just make the chips crispier and taste better! 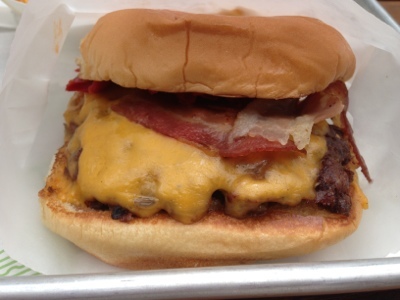 SmokeShack is cheeseburger (can be single or double) topped with smoked bacon, chopped cherry tomatoes & ShackSauce. The bun is very soft and have a kinda "melt-in-the-mouth" texture to it, very different to the normal sesame seeded bun.